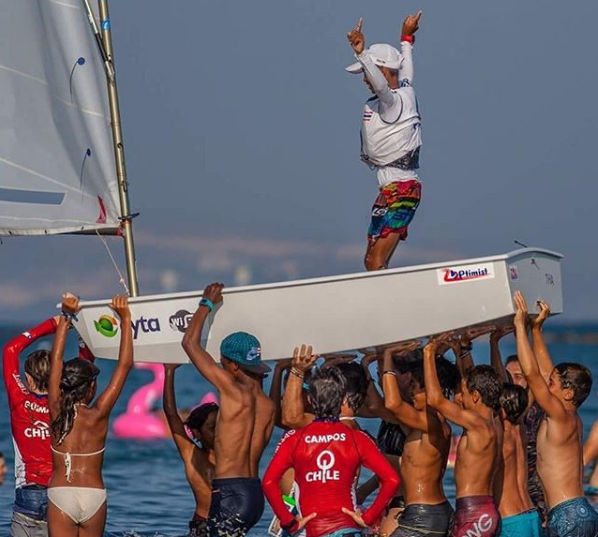 9/2/2018, Limassol, Cyprus — Great day of competition in Team Racing Finals at the 2018 Optimist World Championship. Medium breeze of 10 to 12 knots allowed the Teams to battle it out until the end. Great match-ups and performances for Teams THA, ITA, ESP, USA, ISR, ARG, and many more with the first 3 prevailing. Thailand and Italy managed to moved to the final that took place in light wind. Big advantage for the THA team which sailed great throughout the series and deserved to win the valuable title leaving the Italian Team to second place and Spain the second runner up. Team USA, winner of the last two championships, sailed well and fought hard, but in the end could not overcome some very focused and prepared teams from around the world. USA ended up 4th overall. A great end to team racing competition brings the beginning of a great final series of fleet racing, tomorrow.